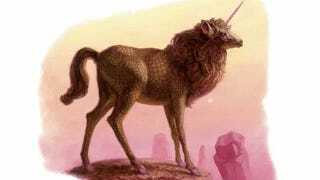 Yesterday, we wrote about a story that's been making the rounds across the blogosphere: that North Korea discovered the lair of a Kirin (or Qilin), a mythical creature often associated with the Western unicorn. However, while North Korea's claim is about a place called Kiringul, which translates to "Kirin's Grotto," the government wasn't claiming to have found proof of the existence of the mythical beast. But what they are claiming still raises a few archaeological eyebrows. Top image from D&D's Oriental Adventures, one example of the Kirin being closely linked to the unicorn. Sixiang Wang, a PhD student at Columbia University whose focus is Korea-China relations from the 13th to the 16th centuries, wrote in to provide some context for the announcement. North Korea actually announced this discovery in 2011, but only recently released the announcement in English. The English release poorly translated the name of a historical location, Kiringul, as "Unicorn Lair," a very evocative name for Westerners. But in Korean history, the name Kiringul has a rather different significance. Kiringul is one of the sites associated with King Tongmyŏng, the founder of Koguryŏ, an ancient Korean kingdom. The thrust of the North Korean government's announcement is that it claims to have discovered Kiringul, and thus to have proven that Pyongyang is the modern site of the ancient capital of Koguryŏ. Qilin image from Wikimedia Commons. Now there are links between King Tongmyŏng and the myth of Kirin; folkloric stories include tales of the ruler riding a Kirin. But Wang notes that it's important to distinguish historical associations with Kiringul from mythological ones. He likens the association of Kiringul with Kirin to the association of Troy with the mythological aspects of the Trojan war, pointing out that archaeological discoveries surrounding the historical city of Troy don't result in claims that the warrior Achilles was half-immortal. Today, the name Kiringul is simply regarded as a colorful name, much like "Devil's Peak" or "Phoenix, Arizona." But even though it's not laying claim to unicorns (or other mythological beasts), North Korea's claims about Kiringul do raise some questions. For one thing, Kiringul was never lost in the first place. The photo of a man-made tunnel found in Pyongyang described as Kiringul at the left appears in Jeon Kwan Su's article "Kiringul sinhwa yŏngu" (Study of the Kirin-gul Myth), published in the Korean journal Tongpang Hakji in 2009. The North Korean press release is unclear on exactly what was discovered, whether it was an older inscription marking the location of Kiringul or the cave itself—or whether it is referencing the already documented Kiringul. And for a moment I stood atop the Pavilion of Floating Jade (Bubyokru, mentioned also in the KCNA release). The city is all empty, under one expanse of moonlight. The stone is now old; the clouds has passed for a thousand autumns. Where now does the scion of the heavens [referring to Tongmyŏng, because of his divine origin] now travel? I let out a long sigh, and lean next to the wind-blown steps. The mountains are green, and the river's water flows on." However, the court official Hŏ Pong (1551-1588) reported when traveling through Pyongyang that even the steps in these locations seemed rather new, and doubted that these locations were actually from the time of Tongmyŏng. Similarly, Jeon Kwan Su believes that the Kiringul in the photo is a newer rather than an ancient construction. Kiringul may have simply been an old name applied to a much newer site. On top of that, many historians doubt that, at the time of its founding, Koguryŏ was even located in Pyongyang. The original location of Koguryŏ is hotly debated, but many believe that the kingdom moved to Pyongyang later in its history. But, while North Korea may not have been presenting evidence of Kirin to the world, Wang believes that the link between the creatures and the government's announcement may not be completely incidental. After all, the Kirin was supposed to appear to wise rulers. North Korean officials may have been hoping to secure Pyongyang's connection to the ancient kingdom of Koguryŏ, while creating an association between their own president, Kim Jong-un, and the larger-than-life rulers of old. Huge thanks to Sixiang Wang for all of his help with this!